1001 Inventions at Bastion House, Melaka. Melaka, February 17, 2015: Award-winning, blockbuster educational exhibition, 1001 Inventions: Kegemilangan Tamadun Muslim, has opened for four months, starting February 17, 2015 at Muzium Dunia Melayu Dunia Islam, Bastion House, Bandar Hilir, Melaka. The state-of-the-art exhibition was welcomed by hundreds of fans, guests and visitors during the opening. Get your tickets now. Visit our 1001inventions.com.my website, facebook or twitter for more information. 1001 Inventions at Pusat Dagangan Terengganu. 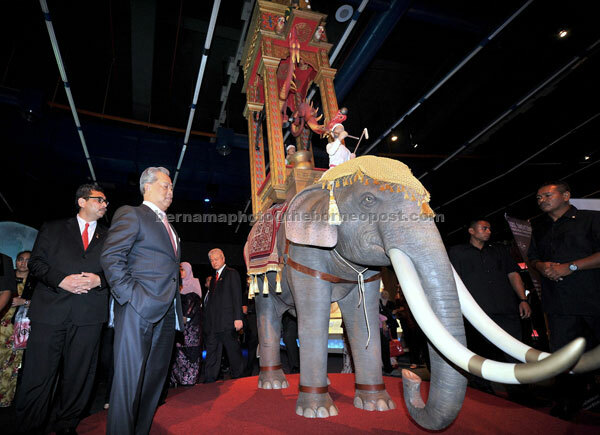 Official Launch of 1001 Inventions by Deputy Prime Minister of Malaysia. 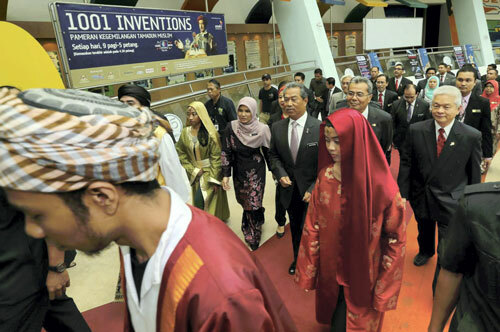 Malaysia’s Deputy Prime Minister launched the internationally renowned 1001 Inventions show at the National Science Centre. The award-winning exhibition, which was declared the world’s best by the European museums Industry in 2011, welcomed visitors at Kuala Lumpur’s Pusat Sains Negara until end of June 2014. 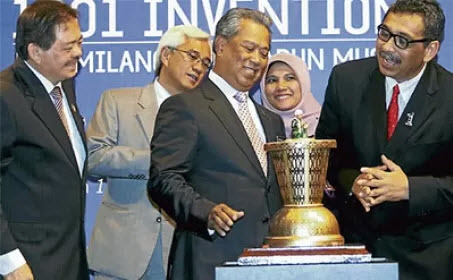 The exhibition was officially opened by the country’s Deputy Prime Minister and Minister of Education, Tan Sri Dato’ Haji Muhyiddin bin Mohd Yassin, who is also the patron of 1001 Inventions in Malaysia, at a lavish ceremony held at the host venue. From the seventh century onwards, men and women of many different faiths and ethnic backgrounds worked together, building on knowledge from ancient civilisations, to make groundbreaking advances in the fields of medicine, engineering, astronomy, agriculture, geology, mathematics, music and architecture. Their achievements still have an impact of the way we live our lives today, and also paved the way for the European Renaissance a millennium later. Mr David Oh Seong Keat, Operations Director of Science Discoveries Sdn Bhd, said: “Malaysia is chosen as the exhibition’s premiere in this region and this will surely help boost our nation’s tourism industry as it is a unique, world class exhibition. “1001 Inventions will also introduce Malaysians to a world of science and technology that will inspire the younger generations to become the pioneering minds of tomorrow,” said Oh. The exhibition has been immensely popular in Europe, America and the Middle East, where a dual language Arabic-English version enjoyed blockbuster residencies across the Arabian peninsula. The Malaysian version of the exhibition features more than 60 exhibits targeting all age groups. This hands-on, interactive and state-of-the-art family-friendly show introduces visitors to the wonders of scientific advancement we have inherited from Muslim Civilisation. 1001 Inventions was voted the world’s best touring exhibition by the Museum and Heritage Excellence Awards in London in 2011, and currently has more than three million online fans on Facebook, Twitter and other social media. Visitors have the opportunity to enjoy five interactive ‘Zones’ that reproduce some of the most astounding inventions of the Golden Ages and demonstrates the broad influence that Muslim Civilisation has had on the way we live our lives today. Visitors will be introduced to the wonders of Muslim Civilisation through an internationally award-winning educational film The Library of Secrets that is projected onto a five-metre-high screen. Told as a short story, the 10-minute movie follows the journey of young children exploring the era of the historically mislabeled ‘Dark Ages’ and this will give them a better understanding and appreciation when they start exploring the main exhibition. Ahmed Salim, from 1001 Inventions, stated: “The exhibition is a powerful educational tool that brings the history of Muslim Civilisation to life in high-tech, exciting and engaging ways that will appeal to school children and adults alike. The launch event was also attended by Datuk Dr. Ewon Ebin, Minister of Science, Technology and Innovation, and Dr Irmawati Ramli, Director of National Science Centre. 1001 Inventions Malaysia is organised by Science Discoveries Sdn Bhd in partnership with the National Science Centre. Science Discoveries had previously brought several science exhibitions to Malaysia from the London Science Museum. The exhibition is open daily from 9am to 5pm. 1001 Inventions exhibition in Malaysia is sponsored by Axiata Group Berhad and supported by the Ministry of Tourism, Tourism Malaysia and supported by the Ministry of Education. 1001 Inventions is a leading and award-winning international science and cultural heritage brand reaching over 100 million people around the world. 1001 Inventions uncovers a thousand years of scientific and cultural achievements from Muslim Civilisation from the 7th century onwards, and how those contributions helped create the foundations of our modern world. Through its award-winning educational programmes, books, blockbuster exhibitions, live shows, films and learning products, 1001 Inventions showcases the contributions of inspirational men and women of different faiths and cultures in a civilisation that spread from Spain to China. 1001 Inventions, in partnership with Abdul Latif Jameel Community Initiatives, have produced a world-class range of exciting and engaging educational experiences, productions, products and resources that are all extensively researched by academics and experts from the UK-based Foundation for Science, Technology and Civilisation.